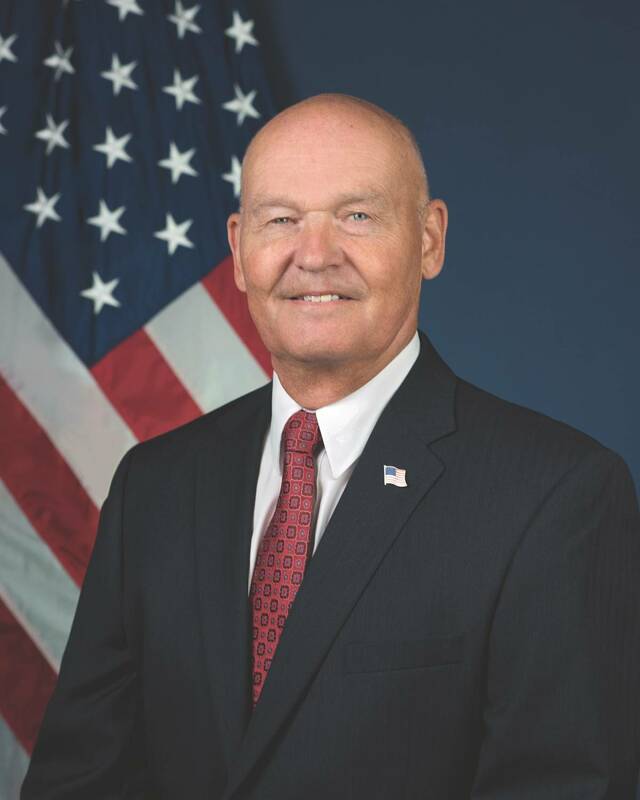 Rear Adm. Mark H. Buzby was appointed by President Donald Trump and sworn in as Maritime Administrator on August 8, 2017. Prior to his appointment, Buzby served as president of the National Defense Transportation Association, a position he has held since retiring from the U.S. Navy in 2013 with over 34 years of service. A 1979 graduate of the U.S. Merchant Marine Academy, Buzby earned his Bachelor of Science in Nautical Science and U.S. Coast Guard Third Mate License. He was commissioned in the U.S. Navy in June 1979, is a graduate of the Joint Forces Staff College and holds master’s degrees from the U.S. Naval War College and Salve Regina University in Strategic Studies and International Relations respectively. Buzby commanded destroyer USS CARNEY (DDG 64), Destroyer Squadron THIRTY-ONE, Surface Warfare Officers School Command, and Joint Task Force GUANTANAMO BAY. As a junior officer, Buzby served in USS CONNOLE (FF1056), USS ARIES (PHM 5), USS YORKTOWN (CG 48), USS JOHN PAUL JONES (DDG 53) and USS SHILOH (CG 67) primarily in operations and combat systems billets. In 1985, he was the Atlantic Fleet Junior Officer Shiphandler of the Year. Ashore, he served on staffs of SIXTH Fleet, U.S. Fleet Forces Command, the Navy staff, and the Joint Staff. Buzby served as the Commander of the U.S. Navy’s Military Sealift Command from October 2009 to March 2013. Buzby’s personal awards include the Defense Superior Service Medal, Legion of Merit (four awards), Bronze Star, Defense Meritorious Service Medal, Meritorious Service Medal (five awards) and various other unit and campaign awards. Arguably, Buzby brings to the Marad c-suite one of the deepest and most relevant experience skill sets of anyone who has filled that role in recent memory. For example, his leadership at National Defense Transportation Association closely parallels his mission focus at Marad, and his Military Sealift Command experience complements his efforts to ensure that the nation maintains a robust sealift capacity – in times of peace and war. Finally, the USMMA graduate has promised to right the ship at his alma mater, while also bringing a keen understanding of both naval and merchant marine operating procedures to an office that must cater to both. As you take the helm at the U.S. Maritime Administration, there will be, to be sure, many things on your plate. If you could choose just one as a priority task to tackle, what would that be? Were I so lucky to only have a single priority to focus on! Since I have never had that sort of luxury in any job I’ve had in my professional career, I’m used to keeping many balls in the air, and that’s how I’m heading into this position. Throughout my confirmation process for the Administrator job, I laid out three priorities for focus, all to be equally pursued. First was to get the U.S. Merchant Marine Academy back on track and headed fair after all the issues related to surveys showing apparent sexual assault/sexual harassment issues at the Academy and during Sea Year training which resulted in the suspension of that training in June 2015. Second was to ensure the readiness of the 46-ship Ready Reserve Sealift Force to answer all bells when called upon in support of U.S. Transportation Command tasking – that includes the ships and the mariners who man them. These ships are old (most are 40+ years), and challenging to maintain. Third was to ensure the strength and viability of the U.S. flag fleet through three key programs – the Jones Act, the Maritime Security Program (MSP), and Cargo Preference. All three are critical to ensuring a sufficient number of U.S. flag ships providing jobs for U.S. Mariners and reliable capacity to support our economic needs in peacetime and in time of conflict or emergency. It all fits together – it’s all important; and I’ve got to pay attention to it all. Immediately prior to joining MARAD, you served as President and CEO of National Defense Transportation Association (NDTA). Since WWII, NDTA has provided a venue where government, military, and private sector professionals can solve pressing challenges in logistics, transportation and passenger travel. A mission set not unlike MARAD, would you agree? There are some similarities for sure. MARAD functions as an advocate for the U.S. Merchant Marine and works to ensure its viability. So we get involved in policies and programs that impact the industry in their peacetime pursuits because we need them ready to do this nation’s heavy lifting – literally – when it comes time to deploy and sustain military forces. I was working the same issues at NDTA, albeit from a slightly different angle, and was doing the same when I was at Military Sealift Command (MSC), but also from a slightly different angle there. In this sealift mission, it really is all about relationships between industry and government. All three organizations – MSC, NDTA, and MARAD are always focusing on relationships with industry. It’s made for a very easy transition for me. The Jones Act has come under repeated fire in the past 18 months – and especially so in the wake of Hurricanes Irma and Maria – from Capitol Hill and other places as well. As the former Commander, Military Sealift Command, you know only too well the need for robust sealift capabilities. Can you assess the status of the Jones Act at present and your efforts to support it – and the domestic waterfront? We saw two waivers of the Jones Act recently; a 7-day waiver focused on moving refined petroleum products to Florida in the wake of Irma, and a 10-day all-products waiver for Puerto Rico following Maria. Both were issued based on a determination of “in the interest of National security.” In both cases, there was sufficient U.S. flag capacity to meet requirements, yet the determination was made nonetheless. Following the expiration of the Puerto Rico waiver, there have been bills introduced in both House and Senate that would permanently exclude the island from Jones Act requirements. While there are some very vocal supporters of these measures, there is a lack of credible data to support claims that the Jones Act substantially increases costs to consumers. While it is popular for detractors to constantly point to the economic issue, they have little to no understanding of the national security implications to the mariner pool, the shipbuilding supply chain, and the layer of internal security that would be lost if the Jones Act were to be abolished. I believe it will stand, and MARAD and the Department of Transportation stand solidly behind it. You are a graduate of the U.S. Merchant Marine Academy after which you served for 34 years in the U.S. Navy as a Surface Warfare Officer rising to flag rank. As someone who has experienced both sides of the maritime equation, give us one thing that your tenure in the U.S. Navy will bring as a benefit to the domestic, commercial waterfront. Probably the most important thing I can bring to the commercial side of the waterfront is firsthand appreciation of the absolute criticality of the role the Merchant Marine plays in deploying and sustaining our forces. That goes for both our land armies and our deployed naval forces. I tell people all the time that our powerful, centerpiece Aircraft Carrier Strike Groups only operate for a limited time at full-tilt before they must be replenished, and MSC and the commercial fleet will carry those supplies forward. And in all likelihood, those commercial ships will be operating in a contested environment, meaning the bad-guys will be hunting them. It won’t be a cruise in the sunshine. Some won’t make it. I need to help mariners understand that it will be different if we get into a serious dustup. You served as Commander Military Sealift Command from October 2009 to May 2013. MSC – an employer where I started my career, coincidentally – employs as many civilian mariners as any other domestic U.S. Commercial firm. Does your time as COMSC yield any better ways that the commercial waterfront could be doing things? Actually, MSC – the “Grey Funnel Line” I believe is still the largest employer of U.S. mariners of any U.S. shipping company. We certainly have the largest fleet. I thought we had pretty good processes in place to maintain and monitor the condition of our ships, many of which were “mature” but still doing the job. Many of our ships operated with COIs – Certificates of Inspection – which of course required an extensive USCG and ABS inspection regime. On top of that, we had the Navy-based SMART (Ship Material and Readiness Trial) inspection and underway operational demonstration which was even more intrusive. Part of that was a detailed documentation process, so we knew pretty well what the real condition of our ships was and typically avoided readiness “surprises.” I think some of that process could be beneficial in the commercial world. Advocating for the U.S. waterfront is a difficult assignment when there are so many different messages to be conveyed. Brown water, blue water, ferries, inland, offshore energy support, small and big shipyards alike – the list is endless. How do you meld those dissimilar needs and demands into a coherent message that will resonate on the Hill? Yes, that is a challenge, and I’m still working on polishing up that message. Just talking about the maritime industry in general is a real challenge because most of it is out of sight to most people – it’s just not part of their daily lives, like airliners, cars and trucks and railroads are. Most ports are out of sight in less desirable areas hidden behind secure gates; most people equate ships with pleasure cruises – if at all. The fact that the vast majority of the products in their daily lives travelled on a vessel during some part of its journey into their hands is totally lost on most. Unfortunately, it has been that way for a long time. It will be a big challenge to transmit that coherent message; I’ll have to work on it. You’ve been in place as the Administrator for about two months now. What’s your view of the business, the domestic waterfront? Give me a SITREP if you would from the Maritime Administrator’s seat. In general terms, I’d say the U.S. flag fleet – Jones Act and ocean carriers – is in steady state at the moment. By that I mean that we haven’t lost any more capacity lately, though some of the Jones Act tonnage is in layup. As I write this, we have 81 internationally trading ocean vessels and about 99 larger-sized Jones Act vessels – many, especially tankers and containerships, being newbuilds. This is the lowest number of vessels we have had in decades. It is barely – barely – large enough to support a pool of mariners necessary to man those ships in trade, surge aboard MARAD’s 46 sealift ships and MSC’s 15 ships in an emergency, and hire into MSC’s CIVMAR workforce. The depressed oil market has idled a lot of vessels and put a lot of mariners on the beach. The ocean carriers have benefited from a slowly recovering container market, increased MSP stipend (now $5 million/year), and some increase movements of DoD cargoes. At the end of the day, without additional cargo, there will be no incentive to add additional tonnage to the U.S. fleet. MARAD, a long time ago, was split out from the U.S. Maritime Commission, with the Federal Maritime Commission assuming a more regulatory role and MARAD taking on a more promotional role. That being said, from your office, where do you think you can have the most impact to the betterment of the U.S. Merchant Marine today? My belief is that MARAD is the one government agency whose primary focus is to pay attention to both aspects of the Merchant Marine: its peacetime commercial role and its wartime national security mission. The first has to be there and be healthy so that the second can take place. I don’t know of anyone else who is thinking about that other than Gen Darren McDew the U.S. Transportation Command Commander. He and I talk a lot. I’ve got to raise the caution flag whenever people start nickering around with some aspect of the merchant marine that I believe will have detrimental effects to the national security mission. It’s a “gotta do,” and my staff and I are focused on it. The U.S. Merchant Marine Academy has experienced a bumpy stretch in recent years, but the last few months have been better ones, and the school headed on the right course on an even keel. MARAD oversees all aspects of the Academy. As KP graduate and the Maritime Administrator, you perhaps more than anyone else will have a strong interest in making sure that the true course continues. Can you sum up the current situation and then tell us about any additional plans that might be in the works? You are correct, I am VERY interested in seeing my Academy making way on a steady course, and I will tell you that my Boss – Secretary Elaine L. Chao feels the same way. We discuss Kings Point every time I meet with her. As I said in my opening remarks – getting the Academy squared away is a top priority. In my first four weeks in the job, I visited the Academy during each one of those weeks, speaking with the Regiment, faculty and staff, then meeting with the leadership of the Parents association, with the Alumni Board of Directors, and then finally with the leadership of all of the Academy’s stakeholders. I spoke with the planning team that is just starting out on a new strategic plan and shared my vision for the Academy with them. With all the groups, I laid out my command philosophy (People first, Be a Professional, Be a good Shipmate), my expectations, and my plan to move the Academy forward. I walked around a lot unescorted, turned up in a lot of unexpected places, talked to staff, faculty, parents, alumni, and most importantly – Midshipmen. I listened a lot. My sense is that everyone is ready to move forward – they want to move forward, and are expecting me to lead them forward. I am ready to do that. I predict we’ll be ringing up a Full Bell soon. U.S. Shipbuilding has had its ups and downs in the past few years, enduring some lows (a dreadful offshore climate) and notable highs (rejuvenated Jones Act blue water building programs and the domestic ferry “boom”). Beyond that, they are competing in certain sectors very well in the international stage (exports have been robust.) MARAD has been there to help with grant programs, etc. What more can be done and how do you plan to support this important sector? This is a very sensitive area again, with national security implications. We absolutely need to cling to what little industrial capability we have in the marine construction and repair area because it has direct impact on the same supply chains that service naval shipbuilding. Both the large “tier 1” building yards and the more numerous but smaller repair and modification yards depend on a relatively limited supply chain where economies of scale are right on the ragged edge for much of the ship fittings and equipment. MARAD has been administering the Title XI loan program to the shipbuilding industry for many years and we’ve seen notable successes and unfortunate failures. I think the program serves an important role when applied to well-considered projects, and I hope that we can continue to be funded to support more projects. I’m also open to explore build-lease options and other creative financing processes to stimulate shipbuilding. There is a lot of new deep water Jones Act tonnage in trade, and more on the way. Lots of leading edge technology is being introduced. It’s all good. I’m very honored to have been asked to serve my nation again as the Maritime Administrator. There is a story to be told about the U.S. Merchant Marine and our shipbuilding, ports and waterways: that all are necessary for our economy to flow in peacetime, and our armed forces to flow in times of conflict. I’m going to do my level best to help folks understand those critical roles. That’s my mission.